The humanitarian and development communities have long been the “frenemies” of international aid. But with a growing strain on resources, is it time to break down the walls between them and forge a stronger, more willing partnership? Whole departments, funding streams and staff are locked into these very separate classifications. Although development programmes complement – and can even reduce the need for – emergency aid response, there is little actual crossover between the two. A paper produced for the Inter-Agency Standing Committee, the UN’s Food and Agriculture Organization (FAO) and the World Bank in December last year observed that while humanitarian assistance has kept many people alive, it has also left large numbers stuck in aid dependency. Development agencies, on the other hand, have not done enough to “focus on… the most vulnerable people in fragile states and protracted crises,” the report noted. The resilience agenda – a concept that has emerged in recent years to bridge the gap – has broken down some of the barriers between the two communities. This question is back on the agenda as governments, policymakers and aid organisations gather in the Ethiopian capital Addis Ababa this week to discuss how to pay for the soon-to-be-ratified post-2015 Sustainable Development Goals (SDGs). The third UN Financing for Development (FFD3) summit will focus on ways to secure funding from new types of actors, especially in the private sector, as well as on improved tax collection, multilateral development banks in emerging markets, and new mechanisms such as risk financing. Similar discussions about how to get more money are going on among humanitarians in the run-up to next year’s World Humanitarian Summit (WHS). And yet they are happening largely in parallel to the FFD3 debate, despite obvious opportunities for joined-up approaches. Sandra Aviles, a senior advisor on programme development and humanitarian Affairs at the FAO, hoped that humanitarians paid attention to what was going on in Addis Ababa this week but wasn’t confident they would. “There is still this notion that there are two pots of money; that development is going to do this and humanitarians are going to do that,” Aviles, who is also part of the Future Humanitarian Financing (FHF) initiative, which is looking at new approaches for emergency aid funding, told IRIN. Dhananjayan Sriskandarajah has a foot in both camps through his role as secretary general of global civil society network CIVICUS and as a member of the newly formed UN high-level panel on humanitarian financing. “Much more needs to be done to bring the development and humanitarian actors together to work more efficiently,” he said. “Whether that’s in thinking about how we can use common data platforms, all the way to that handshake between humanitarian relief and development action. 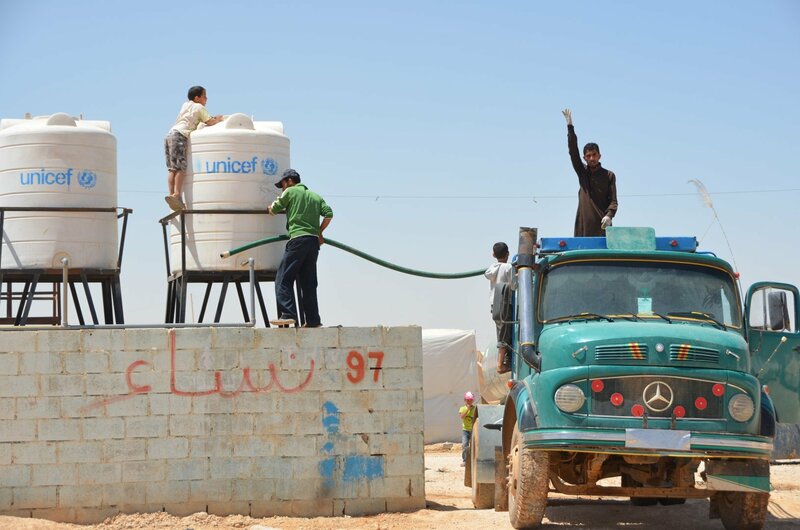 The burden of hosting millions of refugees has weighed heavily on countries like Jordan, where resources such as water are in short supply. Is this a humanitarian or development issue? In an interview with IRIN, Bertrand Badré, managing director and chief financial officer (CFO) of the World Bank Group – regarded as a member of the “development” camp – outlined why he believes the two sectors are “intimately connected” and why they should be working together, especially towards more shared financing solutions. “Humanitarian crises are really shocks, whether they are connected to war or to natural disasters. At the World Bank, we are not involved directly in humanitarian activities, such as managing refugee camps, but our job is to improve the readiness and capacity of a country to face shocks,” he explained. Displacement – previously seen as solely an emergency aid problem – is another area where the World Bank, and other development actors, are starting to become more engaged, particularly around notions of livelihoods, economic integration and resilience-building. In Jordan and Lebanon, the bank is supporting the governments to manage the economic impact of hosting millions of Syrian refugees, and under the lender’s Global Program on Forced Displacement it has also worked with the authorities in Azerbaijan and Colombia. “Development actors are slowly starting to realise that protracted displacement has an impact on development,” explained Manisha Thomas, head of the secretariat of the Geneva-based Solutions Alliance, formed last year to seek out partnership responses to protracted displacement. Rachel Scott, team leader of the conflict, fragility and resilience development co-operation directorate at the Organisation for Economic Co-operation and Development (OECD), agreed that a “much more complementary approach” was required, particularly in the case of displacement. “Changes are needed on both sides. We have to look more holistically at our response. Humanitarians shouldn’t be only analysing the basic physical needs of human beings,” she said, but also considering well-being factors such as economic needs and social cohesion. Investing in better health services, water supplies and sanitation systems should help to reduce outbreaks of diseases that can require emergency aid response and limit a country's development in the longer term. Debate over the parameters of the two sectors is nothing new, far from it. It’s had various labels, including the “relief to development continuum” or Linking Relief Rehabilitation and Development (LRRD). Since the 1990s there has been an extensive body of literature on why the two sectors should – but in many cases have failed to - work better together. “The humanitarian/development discussion has been on the table for longer than I can remember,” said Thomas, of Solutions Alliance. One major barrier to more joined-up thinking is that humanitarians subscribe to four defined humanitarian principles: humanity, neutrality, impartiality and independence. Development funding is meanwhile governed by accords, such as the 2005 Paris Declaration, which stipulates aid should go to governments in terms of developing capacity and helping build institutions. Lydia Poole, an independent aid policy consultant, told IRIN this can sometimes be “extremely difficult” for humanitarian actors, who in certain situations, particularly conflicts, “may have a difficult relationship with the state” and so feel joint programming wouldn’t work. That the funding streams – for the above reasons, as well as administrative and bureaucratic issues – have largely been kept separate is another explanation for the cultural divide between the two sides and their staff. Necessity is the mother of invention; funding – or rather the lack of it – may also end up bringing the development and humanitarian worlds closer together. Simultaneous protracted conflicts such Syria, Iraq, Central African Republic and South Sudan, on top of natural disasters like the earthquake in Nepal, have left emergency aid organisations scraping around for cash. 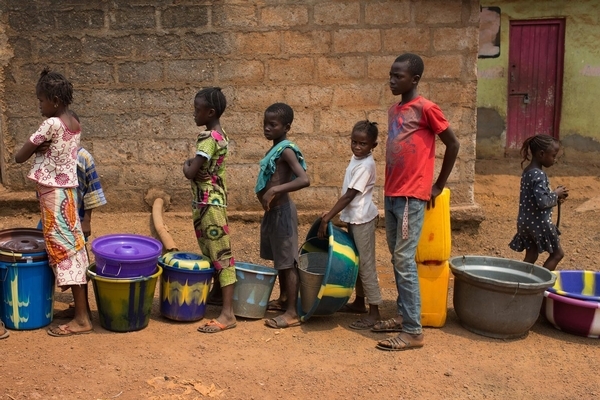 “The financing discussion is definitely one that is driving this move to bring development actors into a displacement response much earlier, and I think it makes sense,” said Thomas, pointing to the example of investing in the water systems of a refugee hosting country rather than continuing to pay out to fix temporary latrines. Sriskandarajah, who is in Addis Ababa this week to chair an event about humanitarian funding, agreed that financing could lead to better cooperation. Badré, of the World Bank, told IRIN: “We have to stop finding opposition to one another, it doesn’t make any sense.